Im here today with a Guest Designer Hat on. Here are the super cute Pool Piggies from Gerda Steiner Designs.. Here are the piggies at different angles. You can get the dies for the piggies as well to save you the time for fussy cutting. They are here. Papers Freebie in magazine ages ago. Pool Piggies Set from Gerda Steiner Designs. Thanks for dropping by today, Im off to be a busy bunny on the garden this weekend. Lots of weeding and sorting out to be done. Glitter N Sparkle. - Bright colors. Simply Create too - Summer Fun. 4 Crafty Chicks - Summer Fun Activities. Hannah and Friends - Summer. I hope you enjoy your garden this weekend - it's a beautiful day! oh your pop usp box is wonderful and so beautifully created. Love the wonderful bright colours and the excellent theme. I live in Kent and we could do with some of your rain. LOL as it's very hot at the mo. Thank you for joining the MAWTT Challenge with this. This is so cute, bright a cheerful Hazel. Thank you so much for sharing your lovely creation with us at Sparkles Monthly Challenges. This made me smile, so much fun ! brilliant summer card. Oh wow what a great box, loving the image you have used and the sentiment. Thanks for joining us over at Hanna & Friends, hope to see you again. 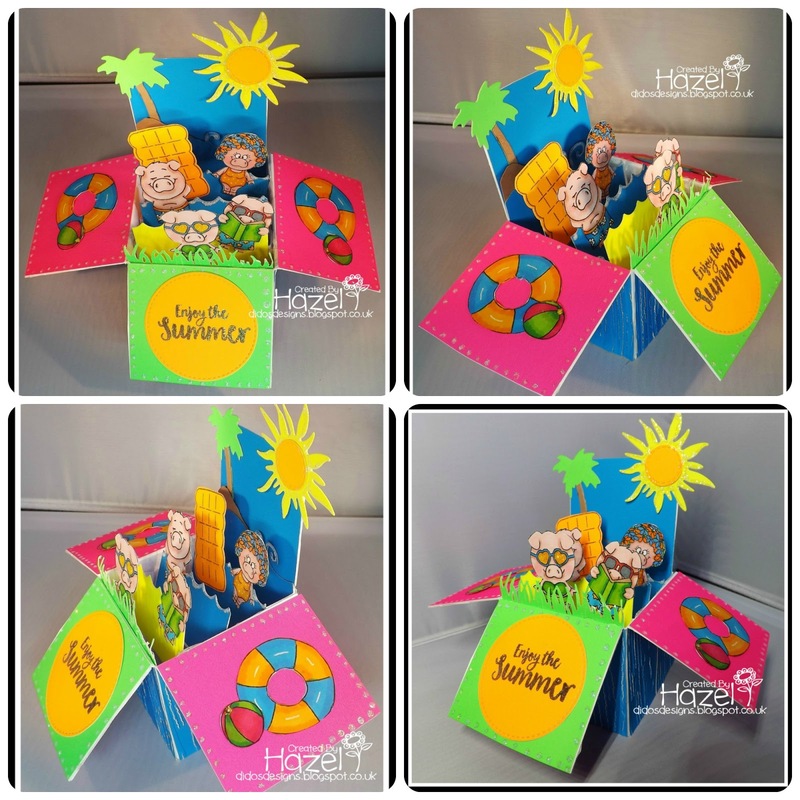 Cute pop up box card! Love those swimming piggies. Thanks for playing with us at 4 Crafty Chicks!